At the 2005 general election, the Liberal Democrats reached a high watermark. With election after election having failed to deliver the much promised ‘breakthrough’ for the country’s then third party, Charles Kennedy’s Lib Dems had cracked it, jumping to a total of 62 parliamentary seats when, fewer than a decade earlier, they’d been stuck around the 20 seat mark. What’s curious for non-statisticians is that, having made that progress, you might expect the number of votes the party had amassed and its share of the overall popular vote to have grown during that period, too. You’d be wrong. 2005 saw the Liberal Democrats attract 5.9 million votes across the United Kingdom, but while the 62 seats the party one remains the most it has amassed since the Liberals first allied themselves with the SDP, it doesn’t represent the most number of votes the party has ever pooled. In fact, it’s not even close. Indeed, the 1983 general election – the first the Liberal Party and the SDP fought together – actually holds that record, with the Alliance (as it was known) having collected 7.8 million votes across the UK. Yet that much higher tally actually only delivered 23 seats back in 1983 – almost 40 seats fewer than the Lib Dems mopped up in 2005 with 2 million fewer votes. How, in a supposedly sophisticated democracy like the UK, can this be true? As you might have already guessed, it’s namely because of our constinuency-based voting system. First Past the Post means that, in each seat, the candidate that polls the highest number of votes gets to go to Westminster. It’s a simple system, yet – as UKIP and the Green Party are now discovering – it also means that you can pool millions of votes all over the UK, taking second places aplenty in the process, yet there’s no guarantee you’ll get any seats at all. Hypothetically, a party could come second in every single seat across the UK, losing each one by just a handful of votes at the time and coming top of the national share of the vote in the process by quite a distance, and yet send no MPs to Westminster at all. In comparison, a more savvy party could stand candidates in just a handful of seats, win a share of those and do abysmally in the rest of them, poll a comparatively minute number of votes on a national basis and yet send more MPs to parliament than the first, more popular party. The system simply doesn’t work. This is nothing new. As anyone who has a knowledge of the Liberal Democrats’ performances in elections over the last 30 years will be aware, the party has constantly complained that First Past the Post simply doesn’t work in an electoral system where there are more than two horses in the national race. The Lib Dems consistently called for a switch to Proportional Representation election after election, and it’s stance was in fact the main reason I was drawn towards the party back when I was at Sixth Form. Of course, you’re probably thinking that it’s not exactly surprising that the party that, at the time, most suffered under First Past the Post would be the first to call for its passing into history. However, if we loop back to 2005, it was clear the party had actually got to grips with the system it claimed to despise. Instead of attempting to amass votes across the entire country as you might expect it to – a strategy that had seen it poll just 680,000 fewer votes than the second placed Labour Party in 1983 – gradually the Liberal Democrats realised that, to succeed, you had to scale things right back. Initially picking areas of the country where its base was always strong, often due to having Liberal Democrats in local councils, the party largely switched to focusing its resources on a comparative handful of seats. Under Paddy Ashdown and later Charles Kennedy, the idea was that once this approach began to deliver victories, you could then move on to focus yet more attention on them, turning them into strongholds over the years whilst simultaneously moving on to your next batch of winnable seats. The end result of this strategy, of course, was that while the number of seats the party held trebled between 1992 and 2005, the number of votes the party totalled across the UK actually fell back. To become a national force, the Liberal Democrats had been forced to transform into a largely locally focused political party. To get more seats in Westminster, you effectively have to sacrifice the national contest and talk only to a handful of key seats. Yet, despite the fact the party had to all intents and purposes ‘cracked the code’ in 2005, the Liberal Democrats didn’t stop calling for a change to the voting system. Before, during and after every election campaign, those at the top of the party would call on a switch to Proportional Representation. The party’s belief that the UK’s voting system was entirely undemocratic and unfair didn’t waver, even though it now understood how to play it for its own gain. You might think therefore that I, as a supporter of Proportional Representation, would welcome the protests that hit the streets of London last Saturday, largely ignored by the British press but pitched initially across social media as a march for democracy. When pictures of the protest first hit Twitter, most commentators I saw suggested it was a reaction against the UK’s unfair voting system, highlighted by the results of 2015’s general election, unveiled in the early hours of Friday morning. Indeed, some of the placards pictured did indeed make reference to Proportional Representation and the fraud that is First Past the Post, but then plenty also carried one simple message: TORIES OUT NOW. What’s interesting about that is, even under full Proportional Representation, the Conservatives would still have been the largest party in the 2015 general election, and would likely have formed a coalition to govern with UKIP, whose number of seats would have been greatly increased under a change to the voting system. It made the protest as a body of people a rather interesting one. On the one hand I was told they were calling on the Government to switch the voting system, and on the other they wanted the Tories out – a party that still would have ‘won’ the election under either system. This bothered me and, unlike the scores of other posts I saw on various social networks, I called these protestors out. 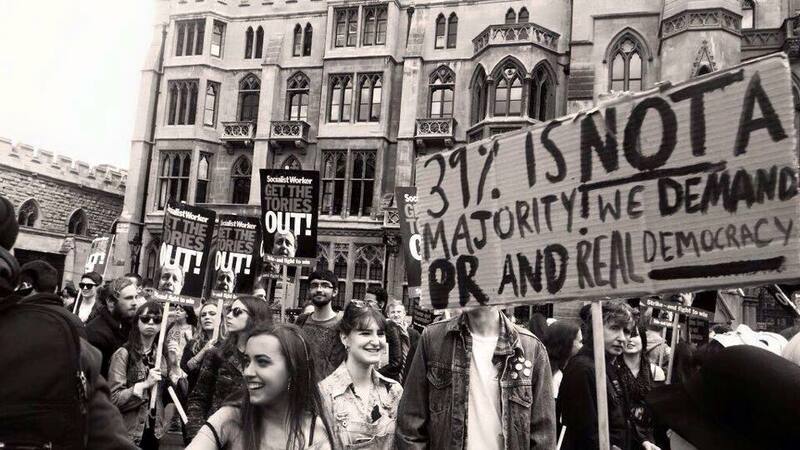 Where were these people in 1997, I asked, when New Labour won 63% of the seats with just 43% of the vote? Why weren’t their protests on the streets then? Indeed, where were they in 2005, when Tony Blair comfortably got in for his final term as Prime Minister with an even smaller share of the vote than David Cameron picked up on Thursday? In fact, why haven’t people been marching on the streets after every single general election, I asked? For as long as all of us have been alive, First Past the Post has always delivered an unfair result. Why were people only reacting now? I think the placards give us a clue. If Labour and Ed Miliband had somehow managed to win power on Thursday, I very much doubt that protest would have ever hit the streets, despite the fact that, because of First Past the Post, their victory would have been just as invalid as David Cameron’s on both a statistical and moral level. Instead, what happened on Saturday was a gathering of people who objected to the Tory win and cannily used existing frustration with First Past the Post to give their stance credibility. This isn’t me being picky, either. This matters. I’ve been an advocate of a change to the voting system for as long as I’ve been politically aware, but not because it was benefit the party I happen to be behind at the time. You’re either for democracy, or you’re not – to start waving your flags and vandalising the capital under the banner of fairness in our voting system is (within reason) absolutely fine, but you have to do it regardless of who wins. This isn’t about changing our voting system so that it benefits one party and damages another, it’s about ensuring that every British citizen’s vote counts, and the problem with people only taking to the streets to call for PR when the Tories get in is that, should the party they support do well next time, we likely won’t see them in five years time. The cause will be dropped again. As an aside, the damage the protestors did to a war memorial was also a wounding blow; not only did it show that those on the streets had little concept of democracy (or, indeed, the people who had died to ensure we had it), but it also enabled Britain’s right wing press to dismiss the march as anarchic nonsense. As a result, that’s exactly how any protest for a change in the voting system will now be seen; manic, violent, and ultimately anti-Tory. These people do not speak for me, and if you want a better voting system for the UK, they shouldn’t speak for you, either – regardless of whether you’re not a fan of the Conservatives or not. The moment you start spinning politics for your own political gain, democracy dies. If you believe in PR, then every single general election you’ve voted in has delivered an unfair and undemocratic result, most more than this one. Fighting for PR means being prepared to flex your muscles regardless of who is in power. Anything less and, frankly, you’re just as corrupt as the political system you claim to be fighting against.